The 1991 letter consisted of a pile of shredded green bar paper I acquired from my place of employment…just enough to fit into a standard envelope. It was supposed to be an “assemble your own Christmas letter.” It was quite funny and clever all at the same time. It made me laugh…which is all that really matters. One sibling tried to put it together. She failed. There was never any Christmas letter. It was all a massive lie designed to bring down the local governments of several South American countries. It, however, did not succeed. Below is a picture representing shredded paper as it may appear in a standard corporate wastebasket. 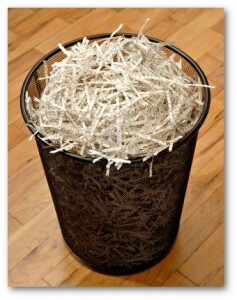 It is not the same shredded paper I sent out. How could it be? They have it now…I don’t.